Gardeners prize the amaryllis (Hippeastrum spp.) for its 10-inch-wide, trumpet-shaped blossoms, according to the University of Minnesota. Blossom colors vary widely, ranging from white to pink to dark red. Grow your own amaryllis plants outdoors from bare bulbs, providing the plant with the appropriate growing conditions to develop into a lush and colorful flower garden. Choose your amaryllis bulbs. Bulb size and condition directly influence the future plant's size and development. Choose the largest bulbs available from the garden store or nursery, and make sure the bulbs are not shriveled in appearance and don't have rotten spots, according to Iowa State University. Prepare the gardening area. 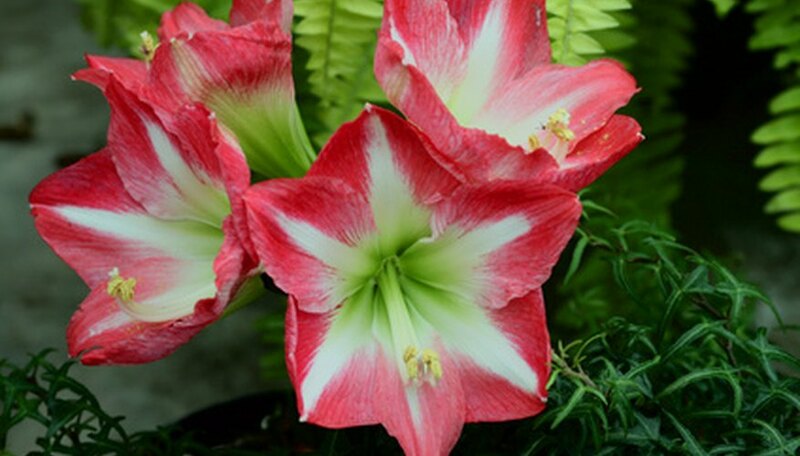 Amaryllis plants like well-drained soil and thrive in light shade. The University of Florida recommends breaking up the soil with a spade and mixing in 4 inches of compost. Follow the compost with 1.5 lbs. of 6-6-6 fertilizer for every 50 square feet of gardening soil. Plant the amaryllis bulbs. Bury the bulb so that its bottom, rooted end is in the soil. The soil should reach halfway up the bulb's side, according to Iowa State University. If you're growing more than one bulb, the University of Florida suggests separating them by 1 foot. Spread 2 inches of mulch around the planted bulbs. This helps keep weeds away and improves soil moisture retention, according to the University of Florida. Water the amaryllis bulbs. Water once a day, moistening the soil to a depth of 6 to 8 inches. The plant will emerge from the bulb's top, typically within 2 to 3 weeks. Fertilize the amaryllis plants every six to seven weeks during the March through September growing season, according to the University of Florida. The university suggests using any all-purpose garden fertilizer, applying the fertilizer at the application rate listed on its label, since potency varies widely by product. Cut off the amaryllis plant's flowers after they've wilted, according to the University of Minnesota. This stops the plant from spending energy on seeds and encourages continuous bulb and foliage growth. After planting the bulbs, the University of Florida says it's not necessary to dig out the bulbs every winter. Instead, leave them in the ground, and they will regrow every spring. Don't ingest the bulb of the amaryllis plant. The bulb contains alkaloids that make it toxic and can cause diarrhea, nausea and vomiting, according to North Carolina State University.